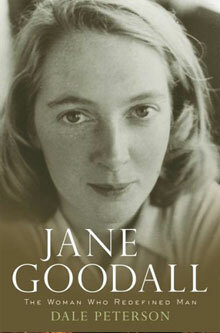 Jane Goodall: The Woman Who Redefined Man began ten years before publication, near the end of 1996, when I was driving my friend Jane Goodall to the airport from a lecture she had given at MIT. The National Geographic had recently published a biographical sketch of her: the woman who had come to fame in the early 1960s with the story of her life among the wild chimpanzees and her startling discovery that chimps make and use tools. But I thought the Geographic piece was superficial, and during our ride to the airport, I said as much to Jane—and then blurted out, “You know, somebody should do a real biography of you. So the project began. It took ten years in part because of the wealth of materials I had. Jane was raised by a mother who seemed never to throw anything away—particularly those letters from her precocious daughter. I was very fortunate to get to know her mother and sister, a little, and to interview her father, her Aunt Olwen (Olly), her nanny, her first husband, her son, her best friend from childhood, and so many others who have, at one time or another, known this brilliant and charismatic woman. The biography was named a Notable Book of the Year by The New York Times, and a Best Book of the Year by the Boston Globe and the Denver Post. It’s been translated into Korean.